Laid down, 21 September 1967, at General Dynamics Corp. Quincy, MA. 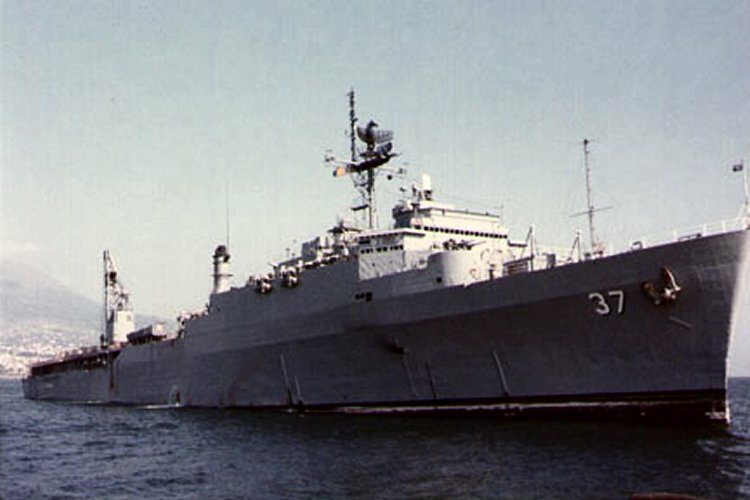 Decommissioned, 4 August 2003, at NAB Little Creek, VA. 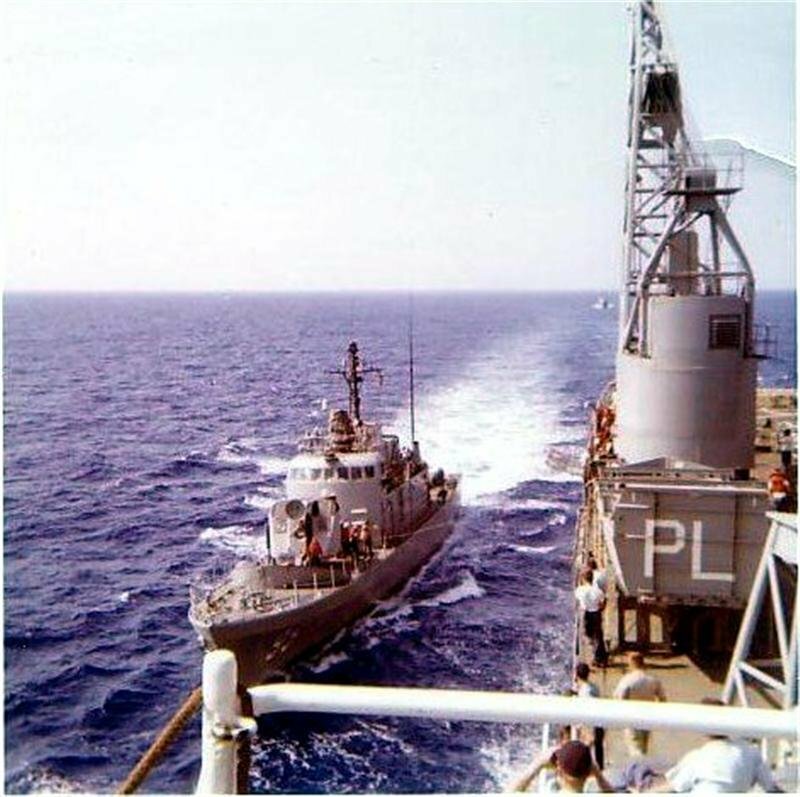 Laid up at NISMF, Portsmouth, VA.
107k Portland (LSD-37) launching, 5 May 1968, at General Dynamics Corp. Quincy, MA.. 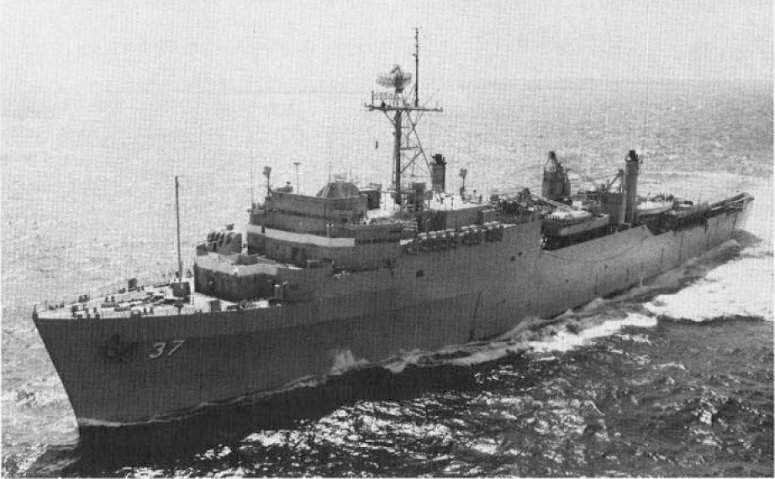 US Navy photo from "All Hands" magazine, October 1970. Joe Radigan MACM USN Ret. 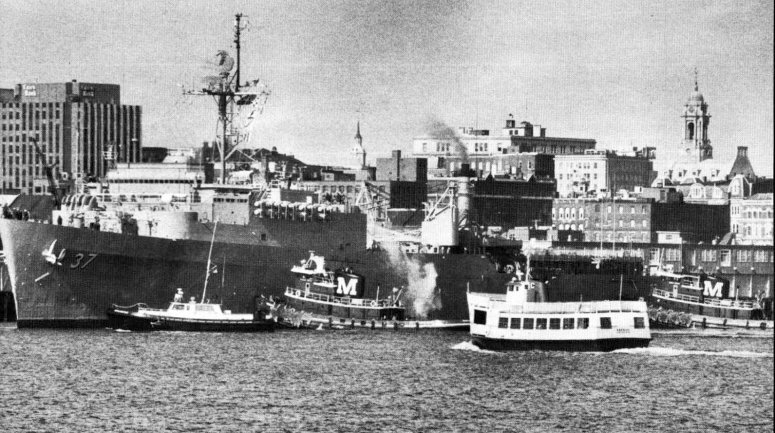 81k Portland (LSD-37) underway during builders trials, circa September 1970, off the coast of Massachusetts. General Dynamics photo. Richard Miller BMCS USNR Ret. 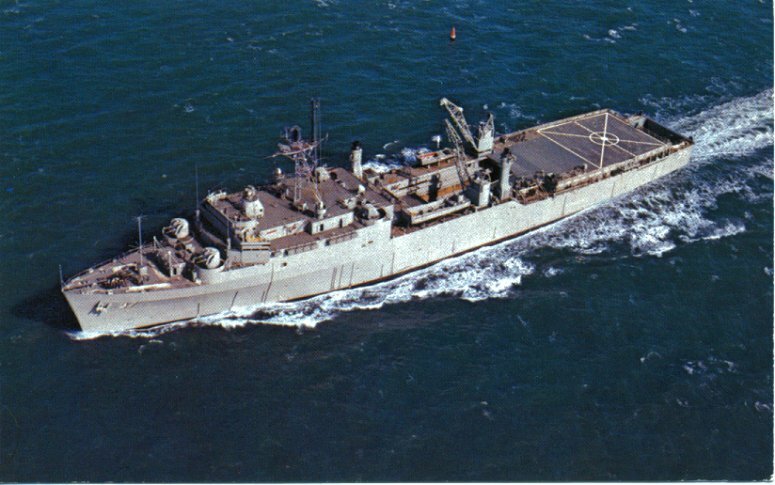 91k Portland (LSD-37) underway during builders trials, circa September 1970, off the coast of Massachusetts. 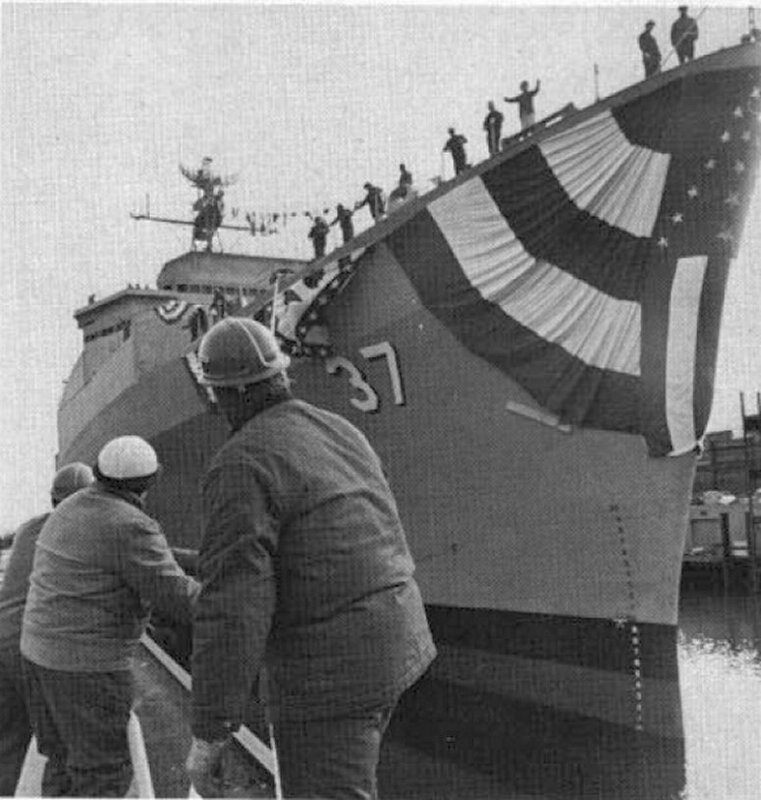 US Navy photo from "All Hands" magazine, March 1971. Joe Radigan MACM USN Ret. 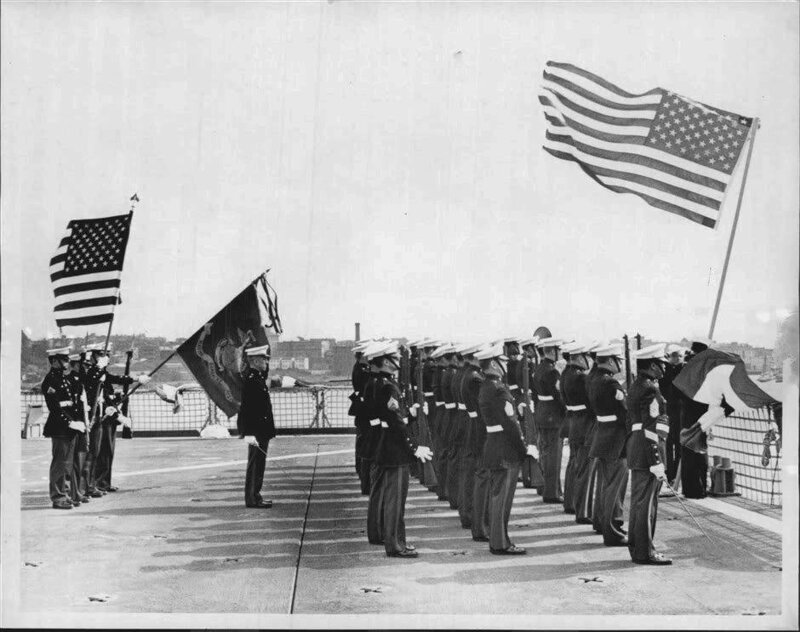 112k Raising of the Colors during the commissioning ceremony for USS Portland (LSD-37), 3 October 1970, at Boston Naval Shipyard. 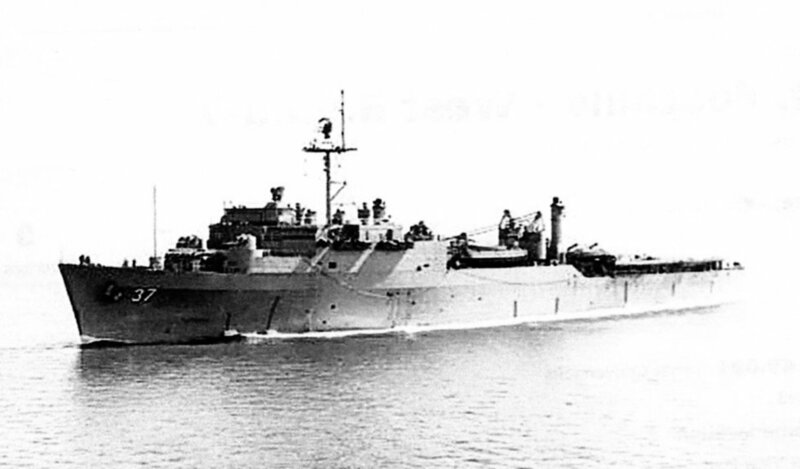 710k USS Portland (LSD-37) underway with stern gate down, date and location unknown. 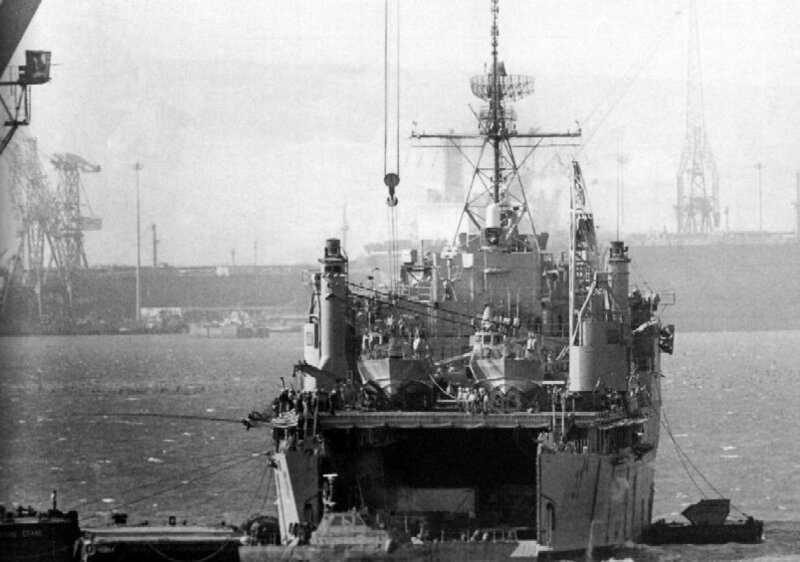 105k USS Portland (LSD-37) moored at Portland, Maine, date unknown. 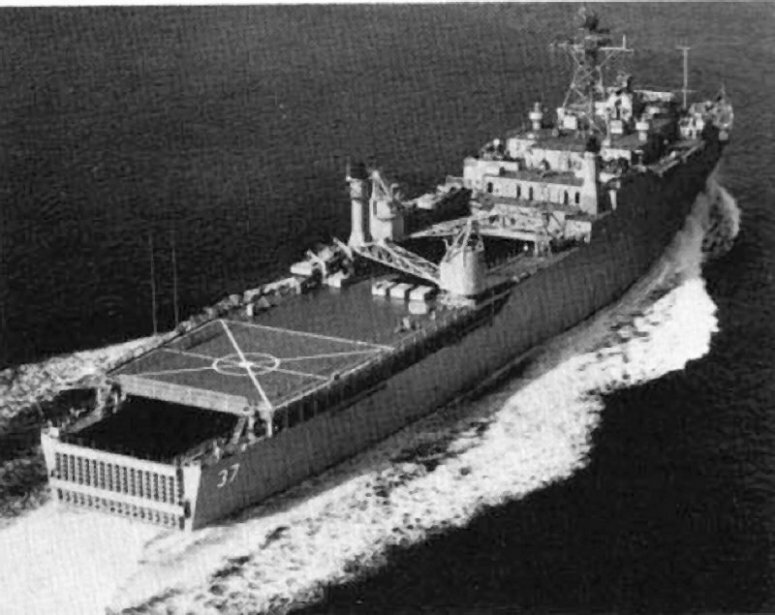 US Navy photo from "All Hands" magazine, September 1979. Joe Radigan MACM USN Ret. 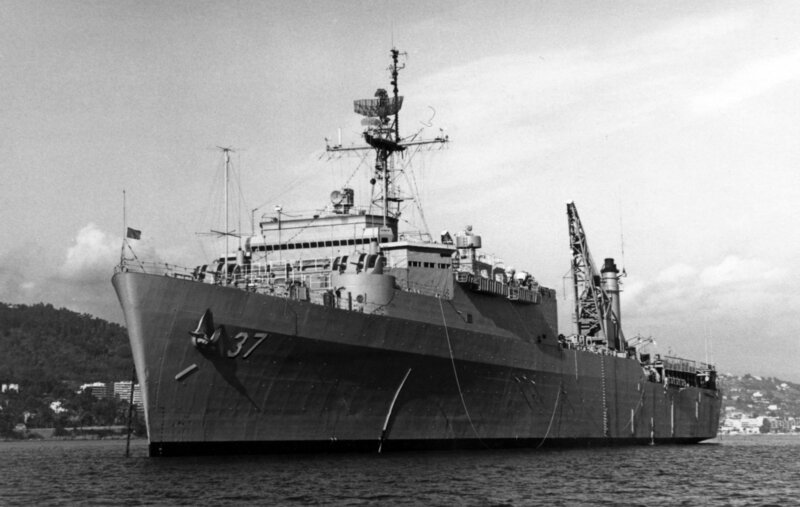 57k USS Portland (LSD-37) date and location unknown. 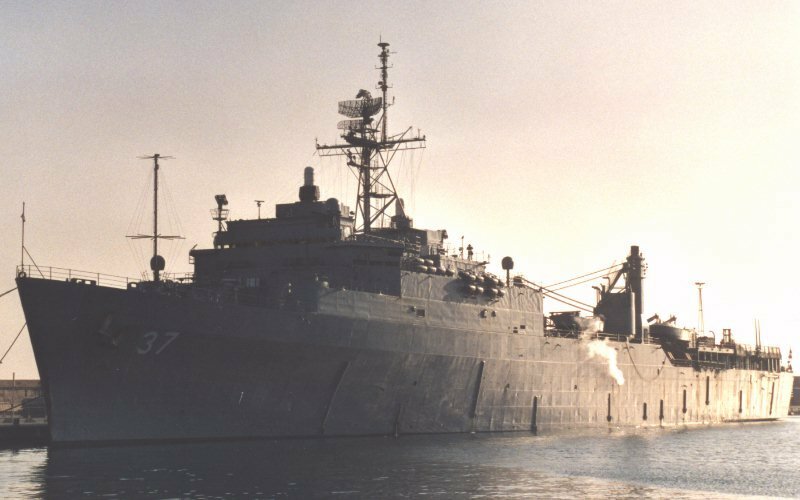 78k USS Portland (LSD-37) underway, date and location unknown. US Navy photo from "All Hands" magazine, January 1988. Joe Radigan MACM USN Ret. 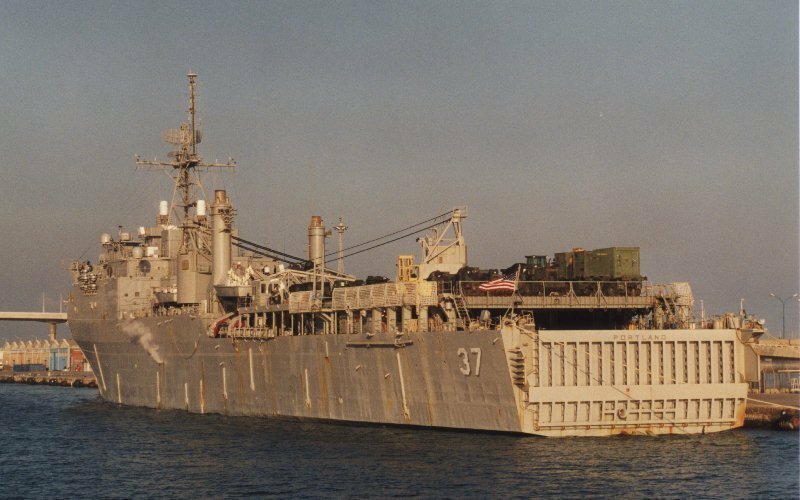 84k USS Portland (LSD-37) with her stern ramp down at Manama, Bahrain, 30 January 1988. 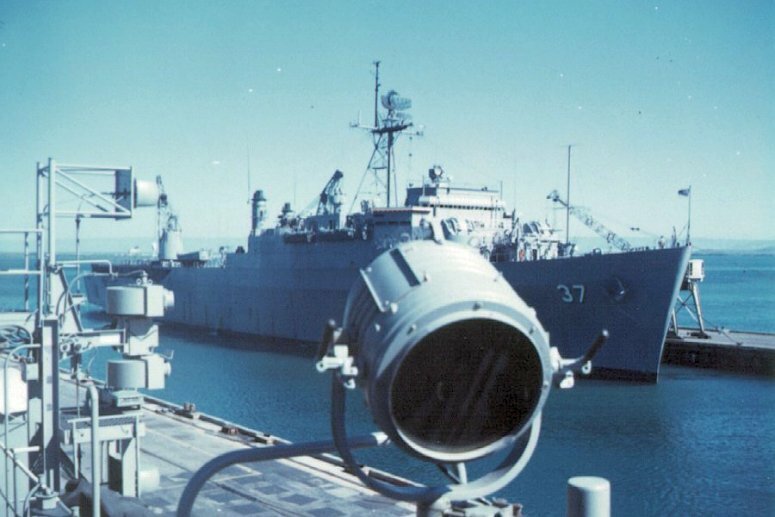 Portland is carrying PB Mk.111 patrol boats on the superdeck. 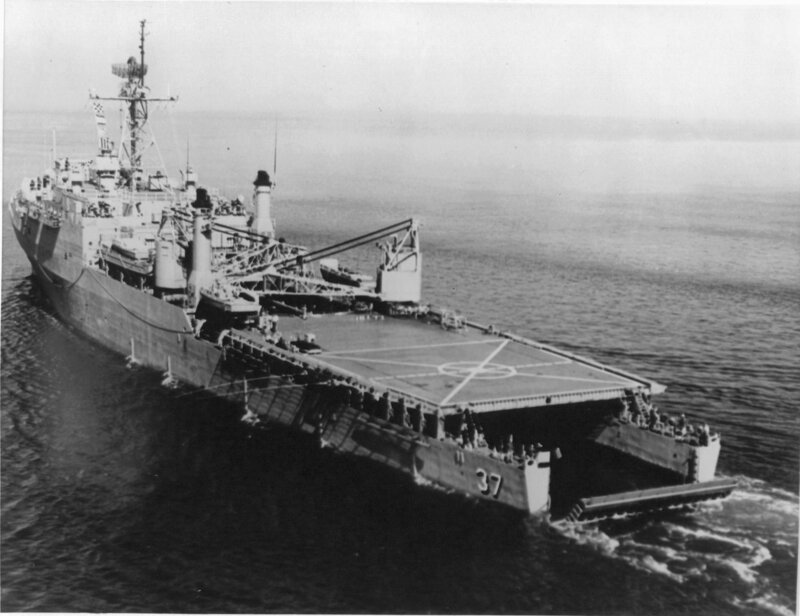 Note cargo containers in the well deck. 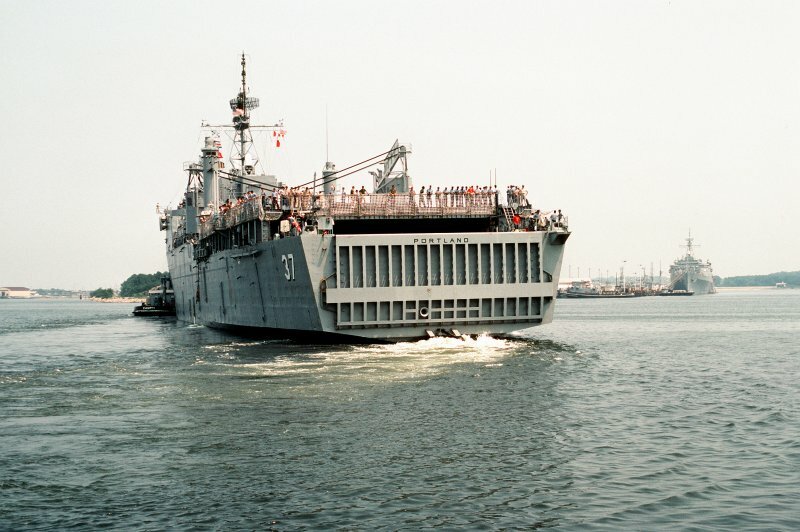 86k USS Portland (LSD-37) departing Naval Amphibious Base, Little Creek, VA., for deployment to the Middle East to take part in Operation Desert Shield, 15 August 1990. The large harbor tug Campti (YTB 816) is alongside to provide assistance as needed. 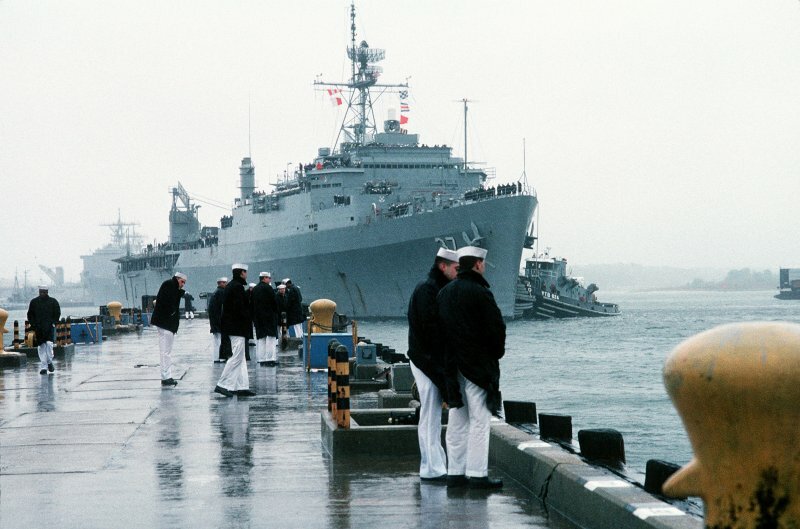 89k USS Portland (LSD-37) being assisted by Campti (YTB 816), departs her homeport at Naval Amphibious Base, Little Creek, VA., for the Persian Gulf in response to Iraq's invasion of Kuwait, 17 August 1990. 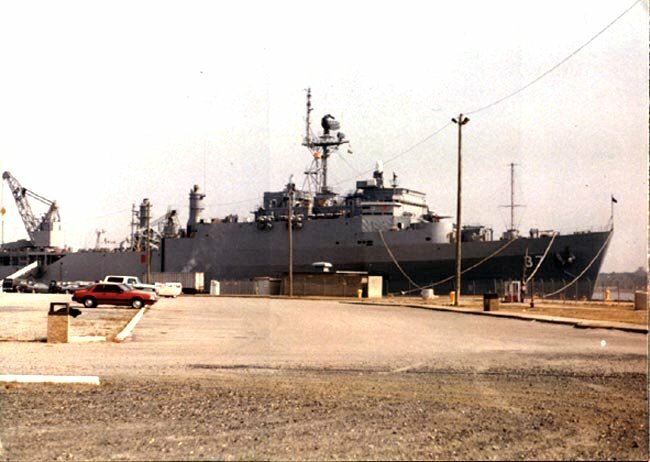 71k USS Portland (LSD-37) is assisted into her berth at Naval Amphibious Base, Little Creek, VA., 20 April 1991, by the large harbor tug Santaquin (YTB-824). 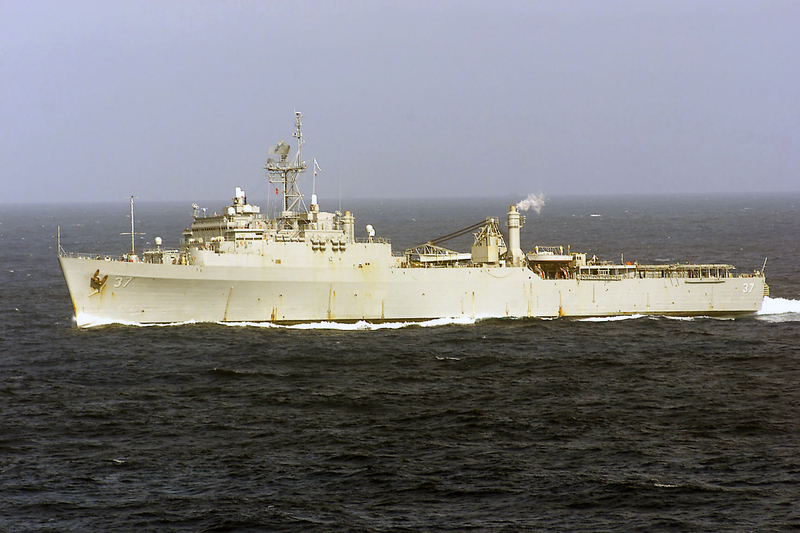 Portland was returning to her homeport following a deployment to the Persian Gulf region for Operation Desert Shield and Operation Desert Storm. 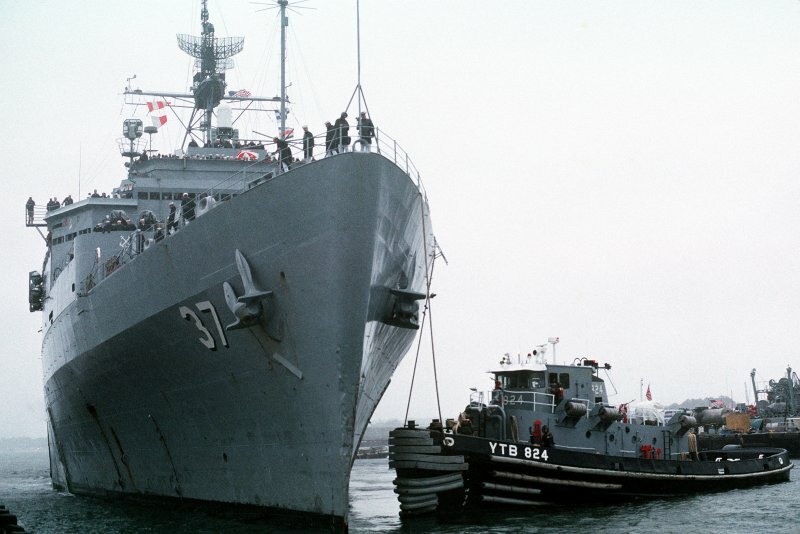 60k USS Portland (LSD-37) is being moved into her berth at Naval Amphibious Base, Little Creek, VA., 20 April 1991, by the large harbor tug Santaquin (YTB-824). 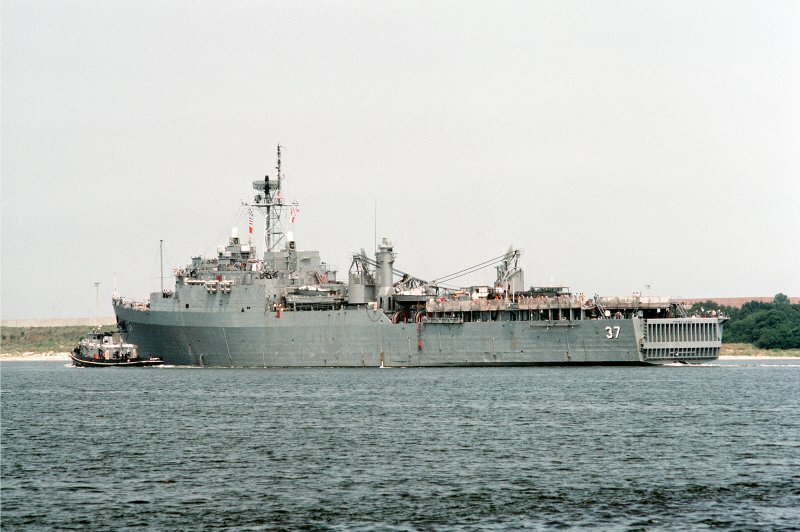 Portland was returning to her homeport following a deployment to the Persian Gulf region for Operation Desert Shield and Operation Desert Storm. 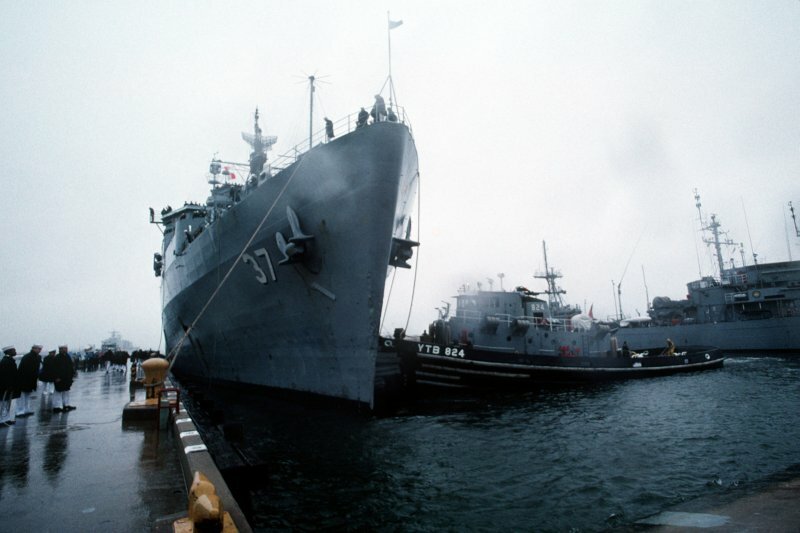 80k Line handlers stand by as the large harbor tug Santaquin (YTB-824) moves USS Portland (LSD-37) toward the pier, 20 April 1991. 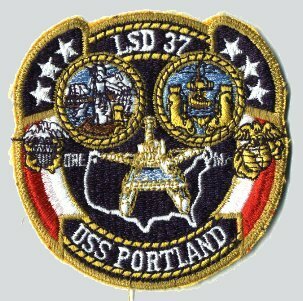 Portland was returning to Naval Amphibious Base, Little Creek, VA., following a deployment to the Persian Gulf region for Operation Desert Shield and Operation Desert Storm. 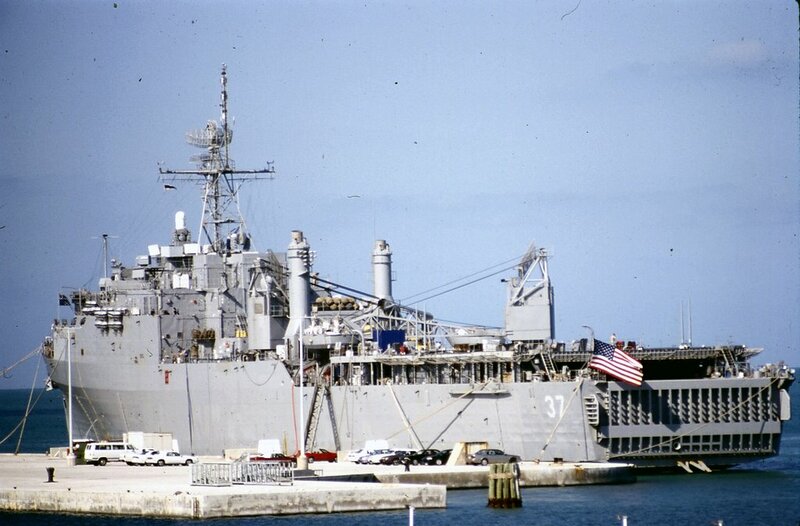 130k USS Portland (LSD-37) moored pierside at at Truman Annex in May 1995. Photo by Raymond L. Blazevic. 216k USS Portland (LSD-37) gets underway in the Chesapeake Bay for a scheduled six-month deployment to the Mediterranean. 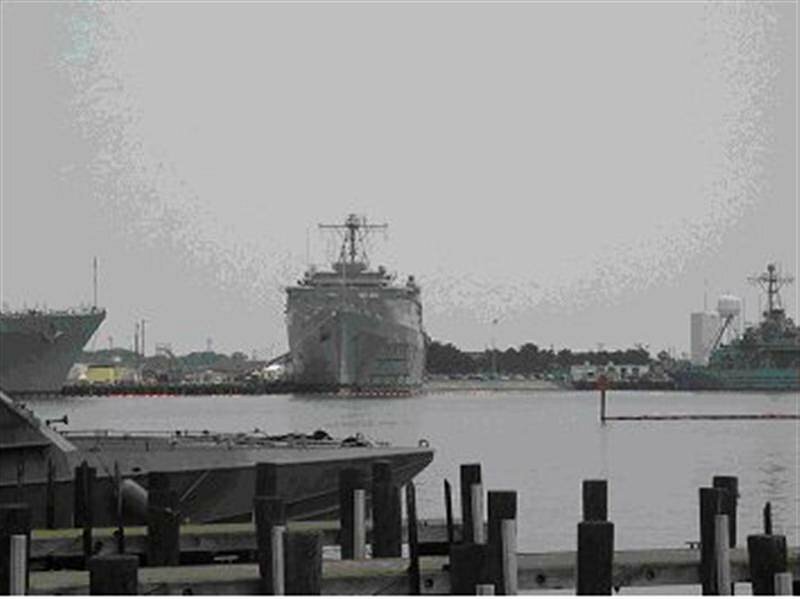 Note the Landing Craft Air Cushioned (LCAC) hovercraft flying by Portland's port quarter. 863k USS Portland (LSD-37) steams through the Atlantic Ocean as one of seven ships attached to Amphibious Task Force-East (ATF-E). 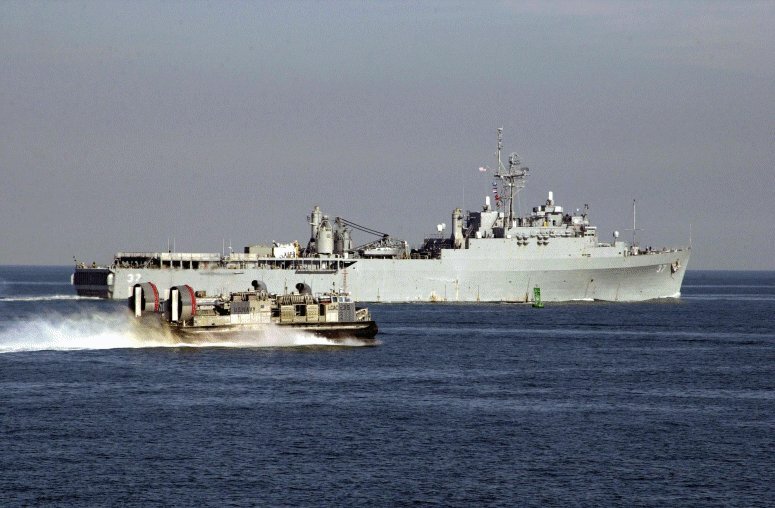 All seven ships were deployed early in their schedules to support the ongoing efforts of Operation Enduring Freedom, 26 January 2003. 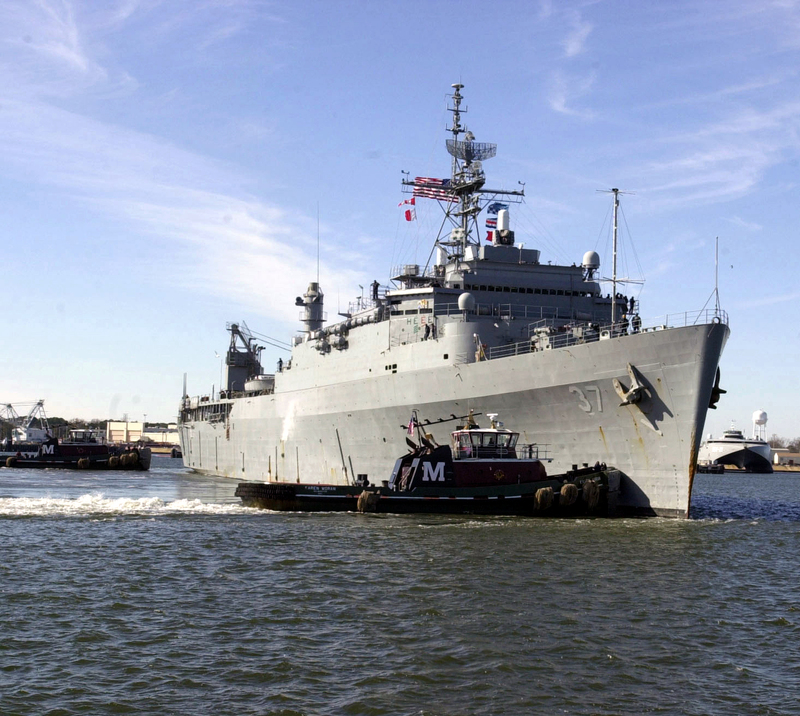 674k USS Portland (LSD-37) departing NAB Little Creek, VA. January 12, 2003.